The roof form is cloud like in nature as it is a free form object defined by the internal program (functional spatial requirements) and the external constrains (solar access to neighbouring appartments). It also possesses the quality of a gradual revealing of the internal content as the roof form drops and dissipates over the smaller spaces. In its urban context, the plan is centred on a through link from the town centre. In consideration of the town centre master plan and the existing context the centre comprises of two entries. 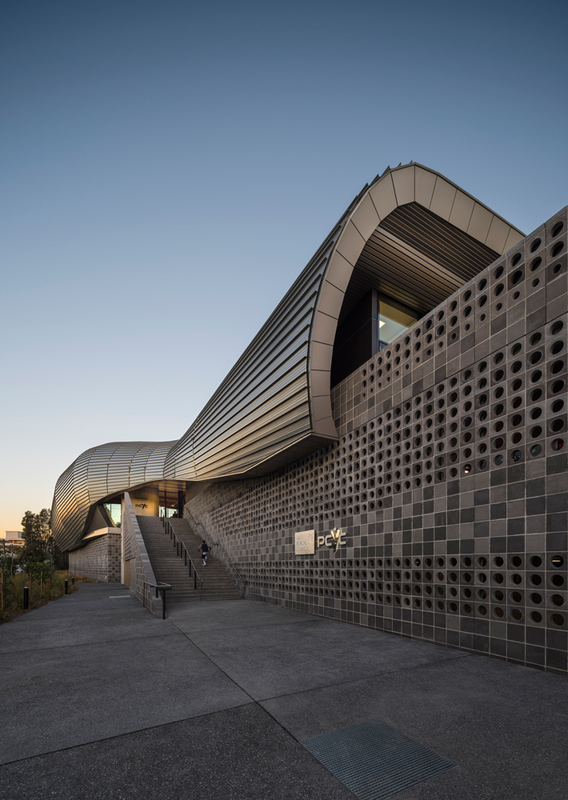 The South entry is directed toward the civic precinct and town centre while the North entry provides access to the immediate surrounding suburban context connected by a ceremonial stair to the ground plain below. 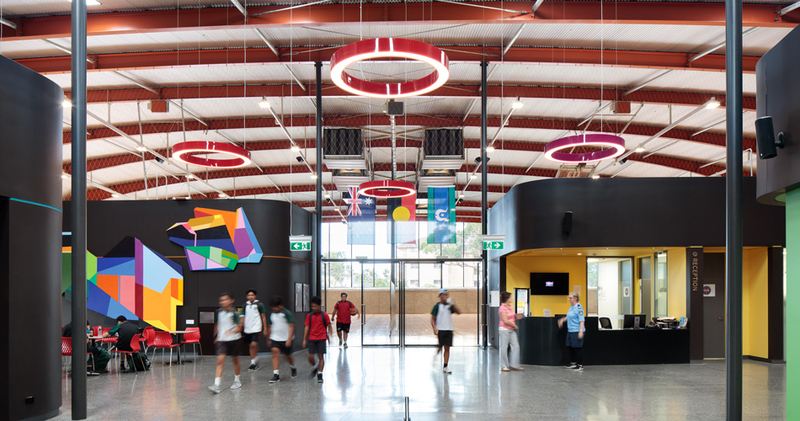 Internally this through connection is juxtaposed with the cross axis path between the sports hall and the multipurpose rooms forming and intersection of pedestrian streets which defines the foyer. This in turn defines the ‘Pods’ - discreet units that house various functional spaces including the ‘Drop-In’ centre and support spaces. 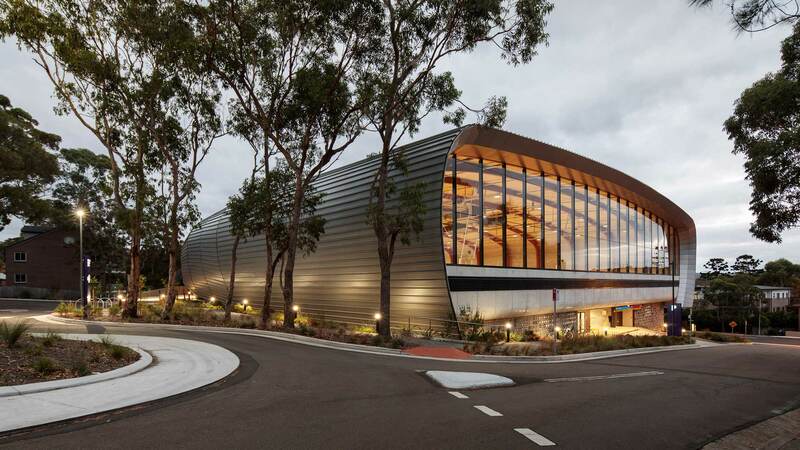 The building shares a site in common with the Brutalist Dee Why Library and Civic Centre. In a respectful gesture to these buildings materials have been allowed to express their natural characteristics. 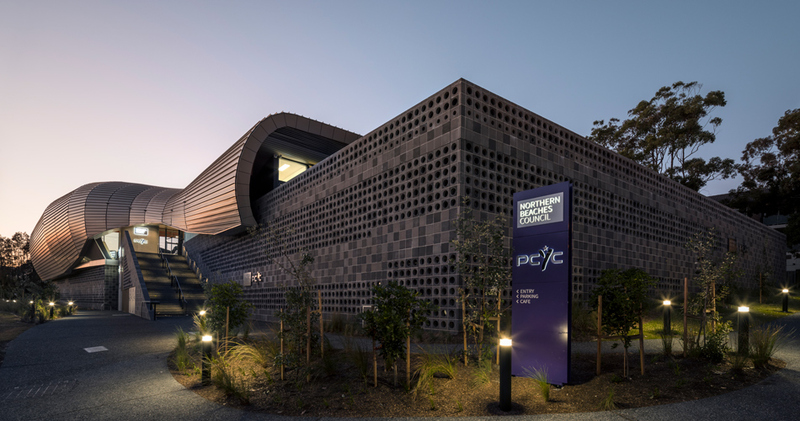 In the facade this includes the use of off-form concrete to feature elements, the rugged texture of the breeze blocks, metallic finishes for metal cladding elements and the exposed aggregate concrete footpath. 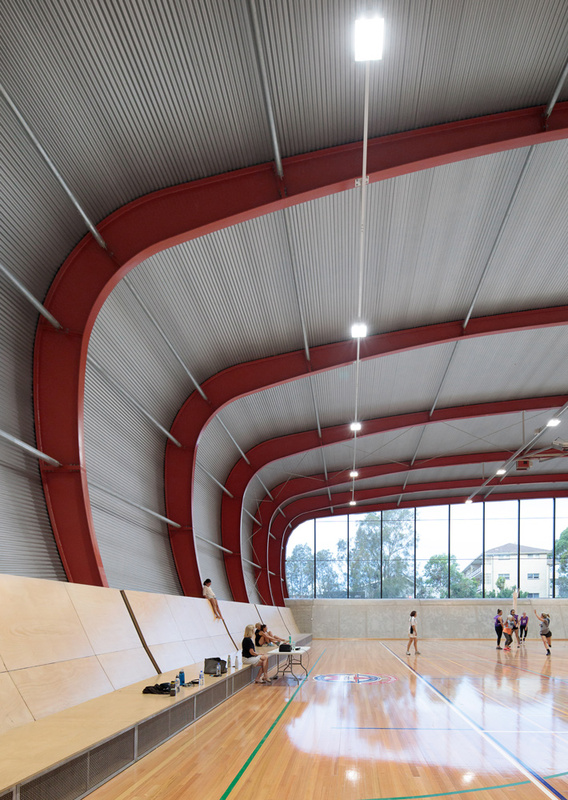 This theme continues internally again with off-form concrete, timber floors, plywood seating, linings, zincalume corrugated soffit lining and the polished concrete floor. The steel steel structure is exposed beneath the shell of the roof and the varying arches - each of which are unique - are highlighted in contrast to the adjacent soffit and secondary structure. 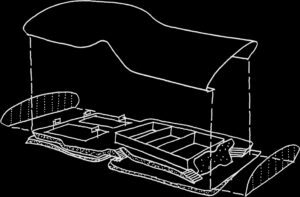 The landscape design seeks to set the building into the site. 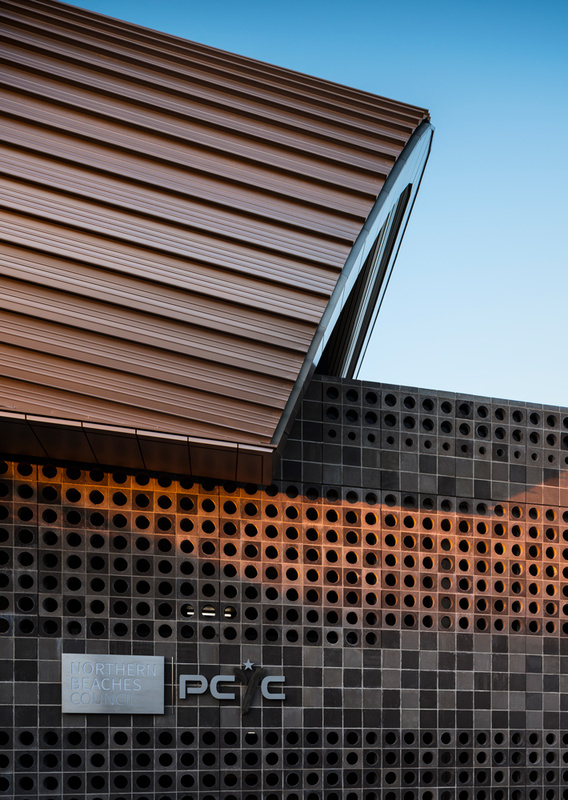 Stemming from the idea of the podium emerging from the ground, the perimeter of the breeze block podium is skirted with climbing plants that will in time gradually conceal the breeze block facade anchoring it to the earth. 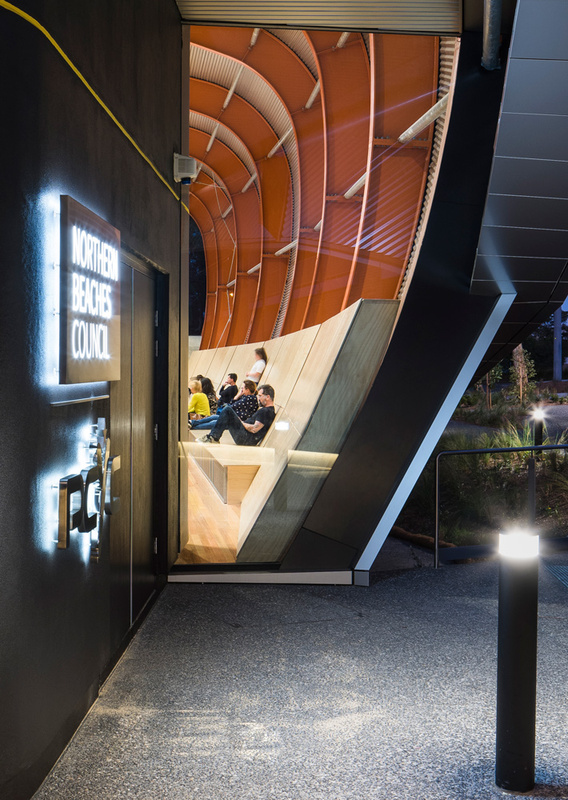 The specific use of native plants offer a resilient and hardy palette that continue the ‘Bush School’ landscape setting of the civic precinct.